Howdy True Believers! As you probably know, at the end of the month Boston Comic Con will be in full swing. Once a fairly small showcase of local shops and talent, the Con is now a major event, drawing attendees from around the East Coast and the country with an impressive selection of guests and vendors. Since so many folks will be visiting our fair city for the first time, Tiny Doom and I thought it would be fun to put together a list of our favorite Boston attractions - restaurants, museums, and of course, comic shops for you to visit. This week we'll focus on spots you can find both around the Seaport World Trade Center, where the con is held, and in other parts of Boston proper. Next week we'll post some spots farther afield for those of you who either have a bit more time in our fabulous metropolis - or for you local readers who are looking for something new to visit. So, the Seaport! This is an up and coming neighborhood - formerly a wasteland of wharves and factories, it's now one of the hottest properties in the city. That means there's plenty of options for food and great sites to explore once you've had your fill of comics culture. We'll start off with eats, because no one wants to live on convention hall food - do they? The first thing you should know about Lucky's is that it's basically unmarked (no outside signage), so pay attention to your map or GPS. This is all part of the Rat Pack/speak easy vibe they have going on. Given this, it's not a bright and airy place. It's dark, subterranean, and may remind you of your grandparents' downstairs. None of these are bad things, but if you are hoping for patio dining after being at the Con all day, this isn't your spot. That said, if you are looking to settle in with pals, drink cocktails, and partake in food that may be a bit splurgy for your diet, this is one of the better spots in the Seaport. When Tiny Doom went on her Mac and Cheese tour of 2014, this spot scored very well. For this area Lucky's would be considered "moderately priced" and the portions are ample. 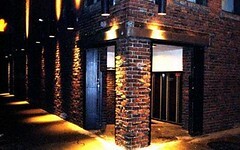 If you are going on a weekend, make reservations, and be aware that this place gets PACKED. If you're looking for a quick sandwich, this is a great option. You can take the Silver Line from the convention center, but I'd just walk - it's far less hassle. 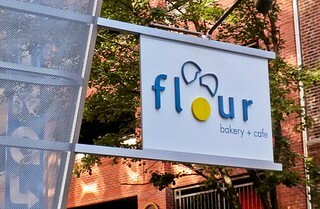 Flour is famous for its sweet treats; chef-owner Joanne Chang trounced Bobby Flay on Throwdown with her justifiably famous sticky buns - but I actually love the savory options here far more. The BLT redefines the sandwich with its thick slices of applewood smoked bacon, and the roast beef, which comes with crispy onion strings, is one of my all time favorite sandwiches. They've also got clearly marked and delicious vegetarian and vegan options, so everyone in your party will be able to partake. And now a few suggestions for what to do when you've spent all of the money you budgeted for comics and autographs! Right down the street from the con, and pretty much right across from James Hook, is the Rose Kennedy Greenway. Formerly the site of the John F. Fitzgerald elevated highway (and the infamous Big Dig project to convert said highway into a tunnel), the Greenway is now one of the nicest strolls in the city, spanning a mile and a half of harbor-side neighborhoods. Featuring cool public art, hammocks, fountains, and a whimsical carousel, the Greenway is just the thing after you've been cooped up with a crowd of eager comics fans all day. 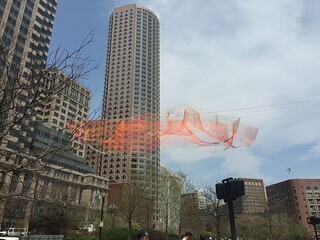 Don't miss "As If It Were Already Here," Janet Echelman's massive aerial sculpture that suspends above the park - the engineering feat alone is a stunner. 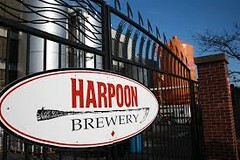 Harpoon Beer is so ubiquitous in the New England area that we sometimes forget it's a microbrewery. But it is, so if you are here from a place where it's less common you may want to walk down the road to brewery for a tour and a tasting. In the beer hall you can relax at long wooden table, taste various beers (often some special ones that aren't widely available), and watch the bottling line. While they don't serve a full menu, like any good beer hall, freshly baked pretzels with dipping sauces are available so you aren't drinking on an empty stomach (don't do that). Tiny Doom and The Goog have been know to spend odd days off from work here, with The Goog always hauling home a growler of something good. 420 D Street, Boston, (just south of Summer Street) Lawn on D is actually just what is sounds like. A big patch of lawn on D Street just waiting for fun and games like some kind of eccentric backyard. And some fun and crazy stuff does happen there! Imagine food truck festivals, music, an ice maze with fire dancers, and giant inflatable rabbits. 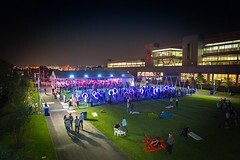 It's a spot for urban relaxation and crazy performance art pop. Check the website to see what's going on while you're in town. This mid-sized museum frequently features art that intersects neatly with comics and pop culture - the Os Gemeos street art exhibit they did a few years ago is a good example - but even when those themes aren't featured prominently, the ICA is worth a look. 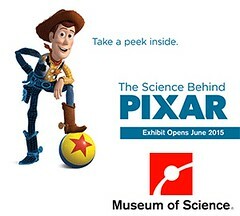 If you're in town on Thursday night, admission is free from 5-9 pm, so you have nothing to lose! The view of Boston Harbor alone is worth a gander, and the current Arlene Shechet sculpture exhibit is both thought-provoking and light-hearted enough for a vacationing crew. The Seaport District and South Boston are just a small section of the city, though - and there isn't even a comic shop there! 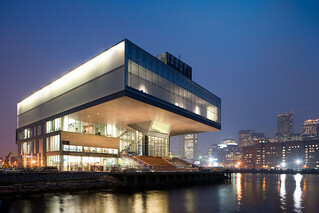 Here are a few other things to check out in Boston proper if you've got some extra time. This spot is a bit off the beaten path. 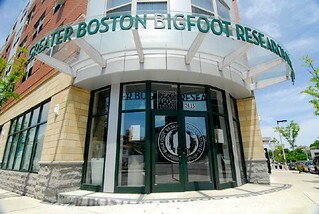 Located in Egleston Square, you won't be able to walk there from the Seaport, but it's a fun little stop for the Bigfoot enthusiasts and cryptozoology buffs among you. A "life-sized" Sasquatch statue features prominently, and other samples from mysterious creatures, including bottles of unicorn tears, are available for purchase. The Institute is actually a small storefront for 826 Boston, a non-profit writing center for area youth. Sales of the books and Bigfoot hunting kits benefit 826, and you can pick up a tee shirt you won't find anywhere else. Even better, if you didn't get enough beer visiting Harpoon, the Institute isn't far from that other Boston brewery mainstay, Sam Adams, and you can squeeze in another tour in the same trek. You need a timed ticket (extra fee) for this one folks, so if you're into it, plan ahead. Truth be told, there aren't too many straight up comic shops in Boston proper (you may encounter a Newbury Comics, but that's more of a music and pop culture store than a place to purchase comics). Comicopia is a real deal comic book store, heavy on the books. 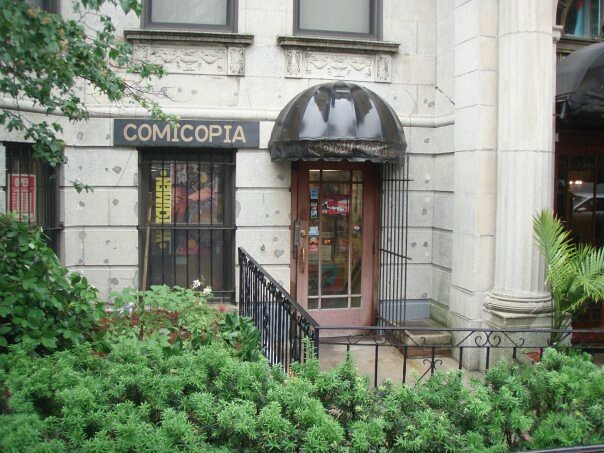 If you are a Manga fan you will definitely want to stop here as Comicopia boasts the largest selection of Manga in New England! The staff is also friendly and knowledgeable, happy to engage and make recommendations. If you can't make it to the store be sure to check out their booth at the Con. Side note - If you are into baseball and history as well as comics, if you're at Comicopia, you aren't too far from Fenway Park. And don't worry, there are many more and varied comic shops in the area, they are just on "the other side of the river." More on that next week. Finished up at Comicopia and looking for a bite to eat? Do yourself a favor and take the C train just one stop up to St. Mary's and visit Mei Mei for some of the best food in the whole city. This little restaurant started life as a food truck specializing in super-local Chinese-inflected fare, including the aptly named Double Awesome, a sandwich that features poached eggs, scallion pancakes, and pure joy. 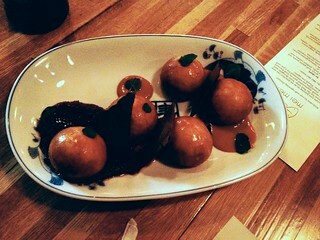 Since opening this brick and mortar location the food has only gotten more creative and delicious. The menu changes frequently, but whatever you get, make sure it includes an order of dumplings. No matter what they're stuffed with, they're always out of sight. Trust me! 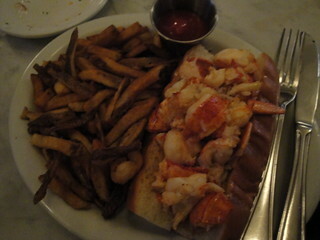 There are many, many more wonderful sites and delicious places to eat in Boston proper, but we wanted to keep most of the suggestions close to the Con and not too overwhelming. Still, if you're a local reader and want to give a shout-out to your favorite spot, let us know about it in the comments. Tune in next week for part 2 - Over the River and Beyond!